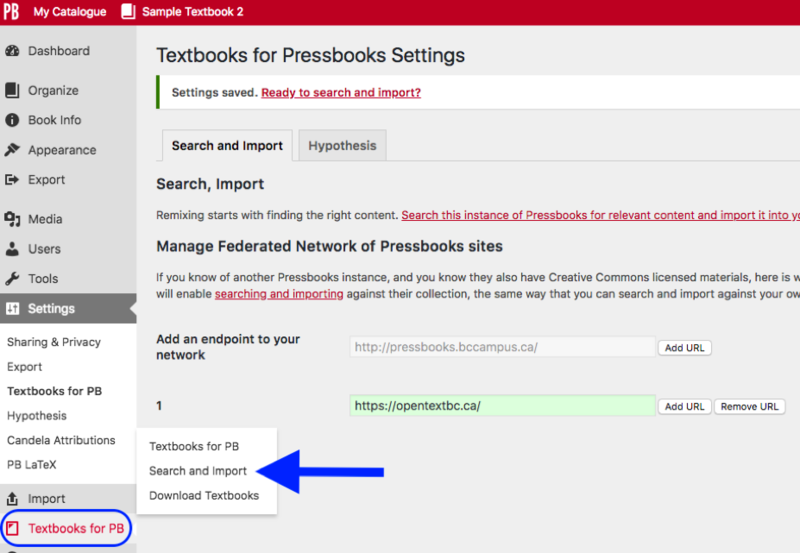 Another way to obtain a copy of content already in Pressbooks is through the Search and Import feature, which appears under the Textbooks for PB tab on the Dashboard menu. This feature allows you to search for chapter or book titles in a given Pressbooks instance. From there, you can select which chapters or books you would like to import into your existing book. Enter the term(s) that you would like to search for in the Search terms field. If you are just browsing, these terms should be general. If you are looking for a specific chapter or book, you may use an exact title instead. Select which Pressbooks instance you would like to search. 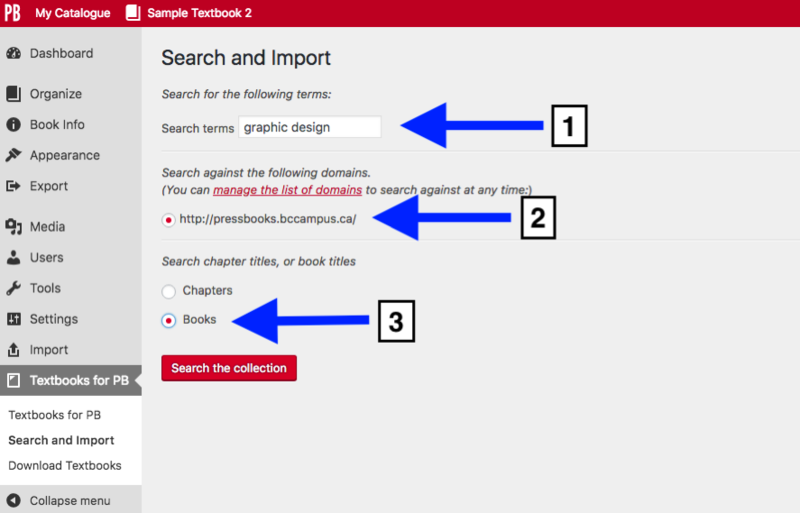 As a pressbooks.bccampus.ca user, that instance is the default search option. Select if you want to search chapter titles or book titles. You can search any Pressbooks instance that has public, openly licensed content available, as long as you know the URL for that instance. 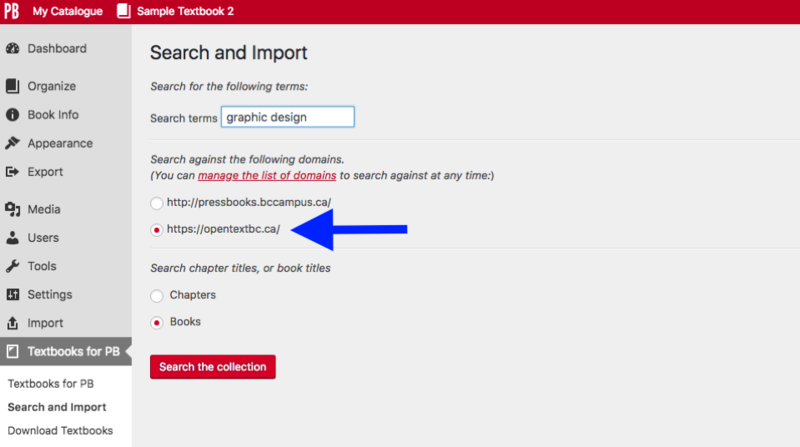 To search another instance of Pressbooks, e.g., the BCcampus internal instance (opentextbc.ca) or another instance such as Open SUNY’s (milnepublishing.geneseo.edu/), click “manage the list of domains” on the Search and Import page. You can also get to this page by clicking the Textbooks for PB link under the Settings tab on the Dashboard menu. 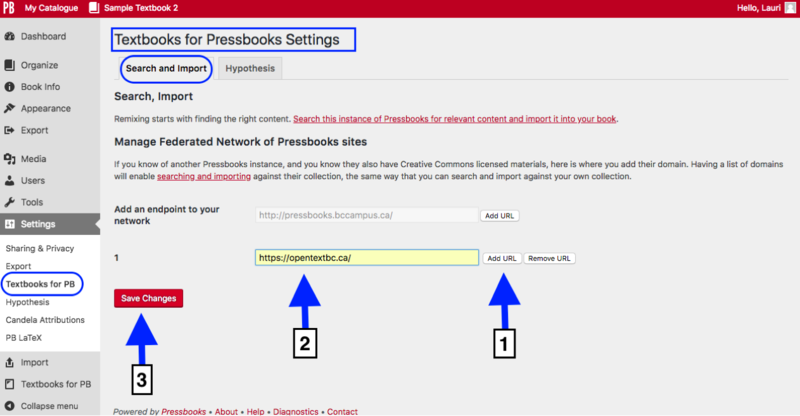 Enter the URL of the Pressbooks instance that you would like to search against. 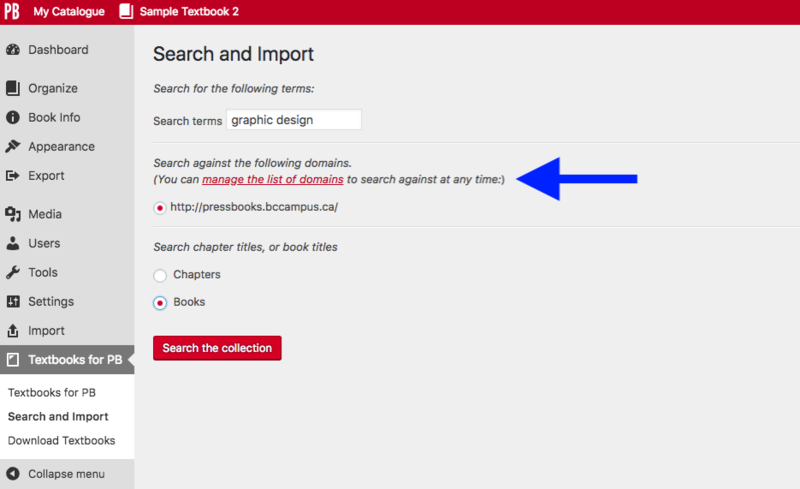 To return to the Search and Import page, scroll over the Textbooks for PB tab in the Dashboard menu and select “Search and Import” from the drop-down list. All Pressbooks instances added to the Textbooks for Pressbooks Settings page will be available to search against with the Search and Import feature. However, you can only search one domain at a time. The licence for each search result is displayed (see arrow #1). You have the option to import all search results by selecting the box beside “Select all” (see arrow #2). If you don’t want to import everything, you can select the radio button beside the resource you want to import (See arrow #3). To import, click “Start” (see arrow #4). The import can take several minutes, depending on the size of the file. The disadvantage of using the Search and Import feature to import a whole book is the inability to select the chapters and parts wanted before importing. Instead, one must accept all chapters and parts as they appear in the original book and make changes after the import. 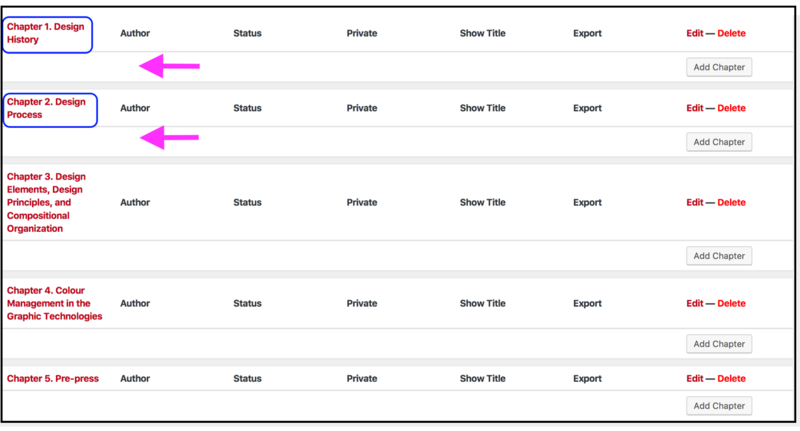 When importing an entire book using the Search and Import feature, chapters and parts may be separated. In the below example, the chapters were taken out of their parts and added to the Main Body part that appeared when the book shell was created. The parts are listed after. We are aware of this problem and are working to resolve it. In the meantime, if this happens to you, you can use the drag-and-drop feature to reorganize the chapters and move them into their proper parts, and then delete the Main Body part when you are done. There are many ways to obtain an editable copy of openly licensed Pressbooks content. For more information, see Import Options for Pressbooks Content. Search and Import a Pressbooks File by Lauri M. Aesoph is licensed under a Creative Commons Attribution 4.0 International License, except where otherwise noted.